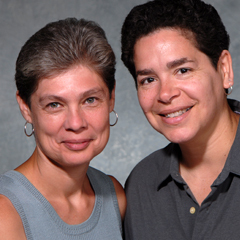 Noriega and Cardona are one of Chicago's power couples, active on a wide range of GLBT and Latina issues, including thru Amigas Latinas. Noriega has been a community political and cultural activist since the 1970s, including roles with Lambda Legal, Amigas Latinas, and much more. Cardona is a founder of Amigas Latinas, on the board of Center on Hasted, and is active on a range of issues.